Downloading shapefiles, learning essential tools, exploring the ArcMap table of contents, understanding shapefiles, customizing shapefiles, saving projects. Shapefiles are the building blocks of many maps and a natural place to begin. Shapefiles are layers that can be stacked on top of each other, like a layered cake, to create one composite map image. Shapefiles contain both the map and the underlying data for the map. 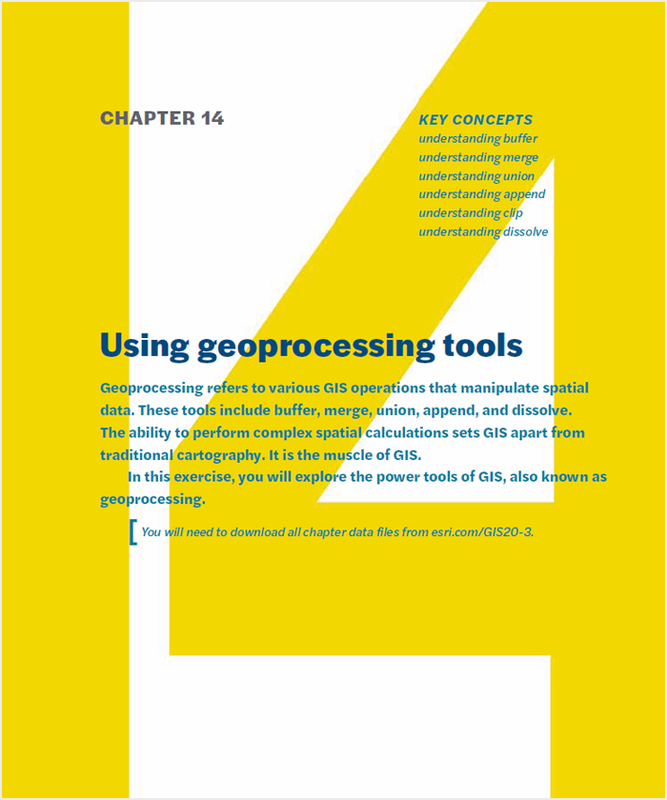 In your GIS life, and in this book, you will need various types of shapefiles. 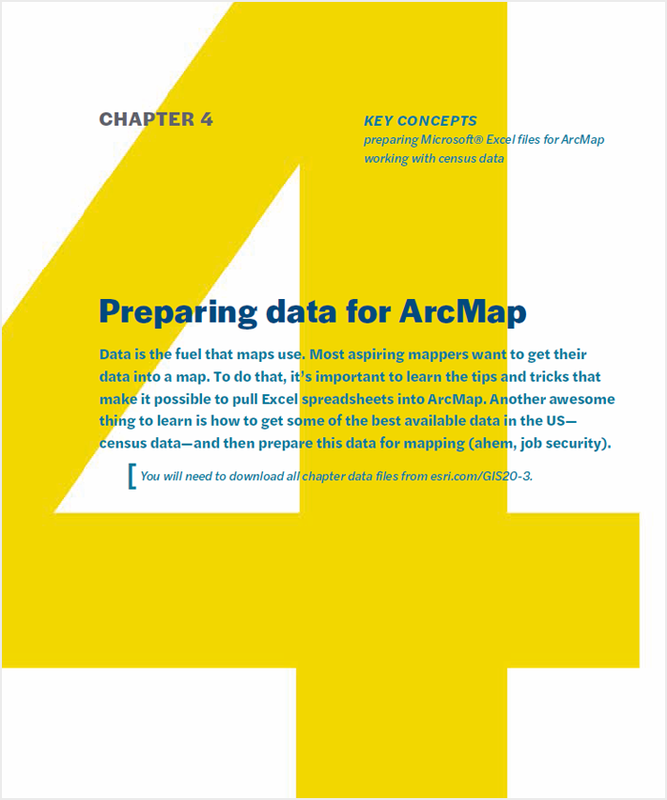 You will also need an understanding of essential tools and key ArcMap features such as the table of contents. Anyone who watches cooking shows knows they breeze right over all the prep work— well, that’s not the case here. 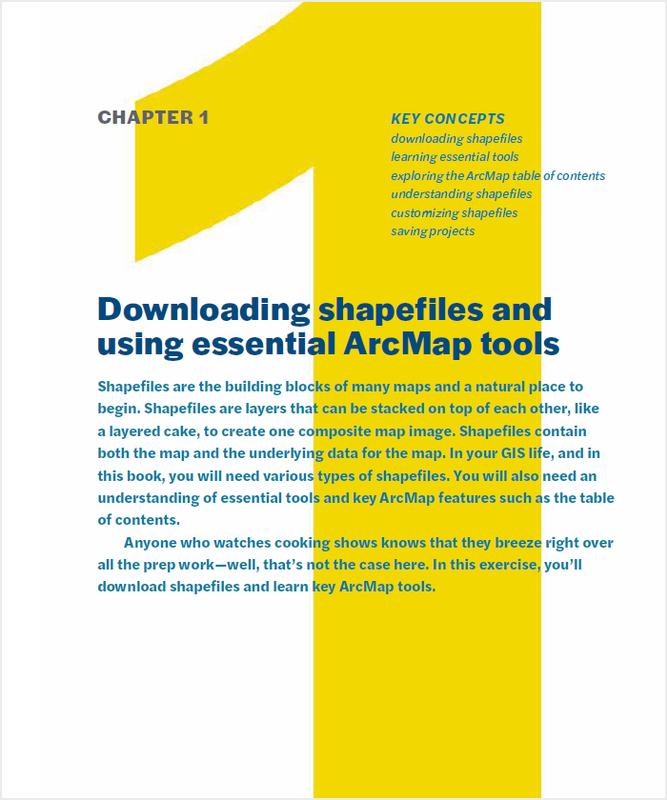 In this exercise, you’ll download shapefiles and learn about key ArcMap tools. Working with multiple layers, changing map colors, creating labels, creating layouts, creating legends, creating titles, using scale bars, using north arrows. Reference maps are basic, traditional maps like those you see in atlases. Their purpose is to illustrate geographic boundaries of a given area such as cities or counties. These types of maps are the cornerstone of cartography. Layouts contain titles, legends, north arrows, scale bars, and many other graphic features. It is important you learn to create layouts that help your reader quickly understand your map. In this exercise, you will make your first map. Changing projections, understanding UTM, understanding state plane and custom projections, recognizing and solving common projection problems. 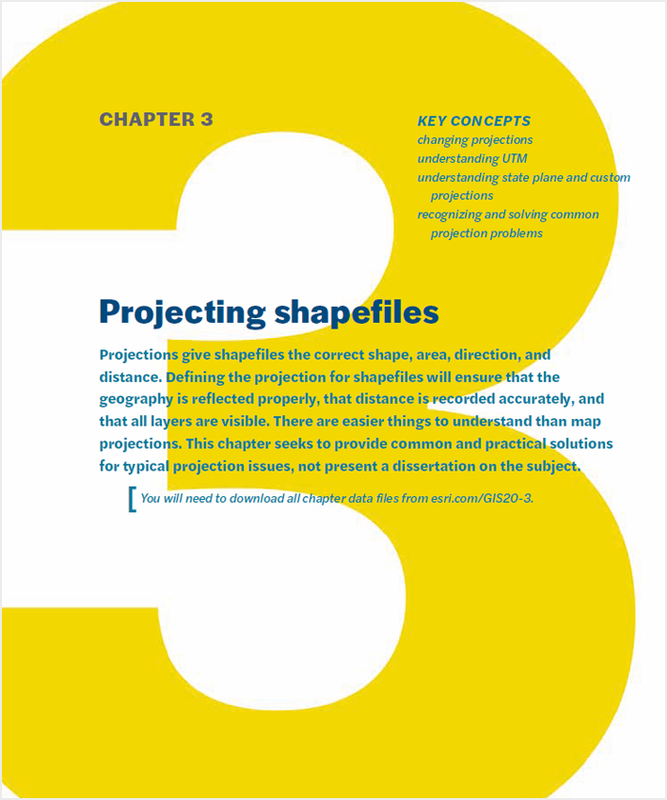 Projections give shapefiles the correct shape, area, direction, and distance. Defining the projection for shapefiles will ensure that the geography is reflected properly, that distance is recorded accurately, and that all layers are visible. There are easier things to understand than map projections. This chapter seeks to provide common, and practical, solutions for typical projection issues, not present a dissertation on the subject. Not going to lie, this isn’t the glamorous part of GIS—but it is hugely important. In this exercise, you will project shapefiles. Preparing Microsoft® Excel files for ArcMap, working with census data. Data is the fuel that maps use. What most aspiring mappers want to do is get their data into a map. To do that, it’s important to learn the tips and tricks that make it possible to pull Excel spreadsheets into ArcMap. Another awesome thing to learn is how to get and prepare for mapping some of the best available data in the United States, census data. Understanding unique IDs, understanding FIPS codes, joining Excel files to maps. 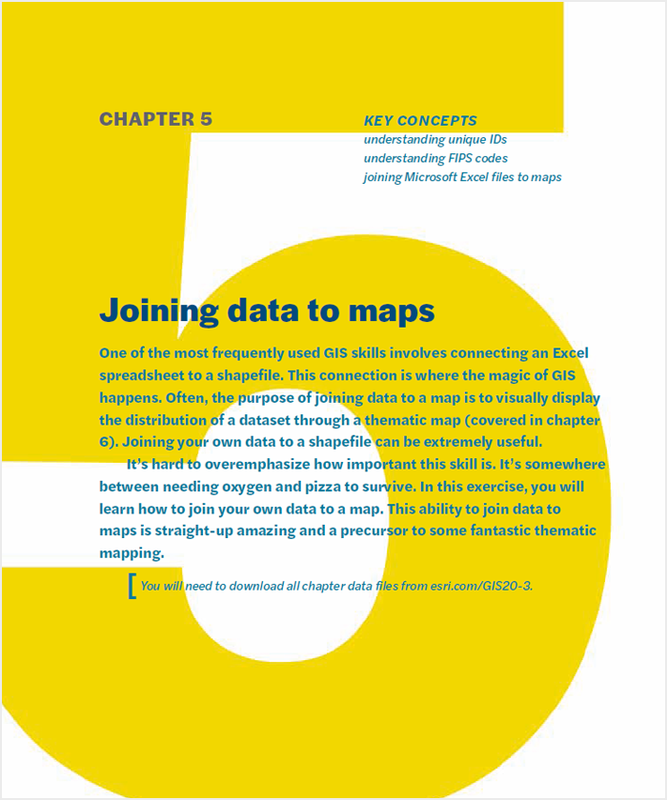 One of the most frequently used GIS skills involves connecting an Excel spreadsheet to a shapefile. This is where the magic of GIS happens. 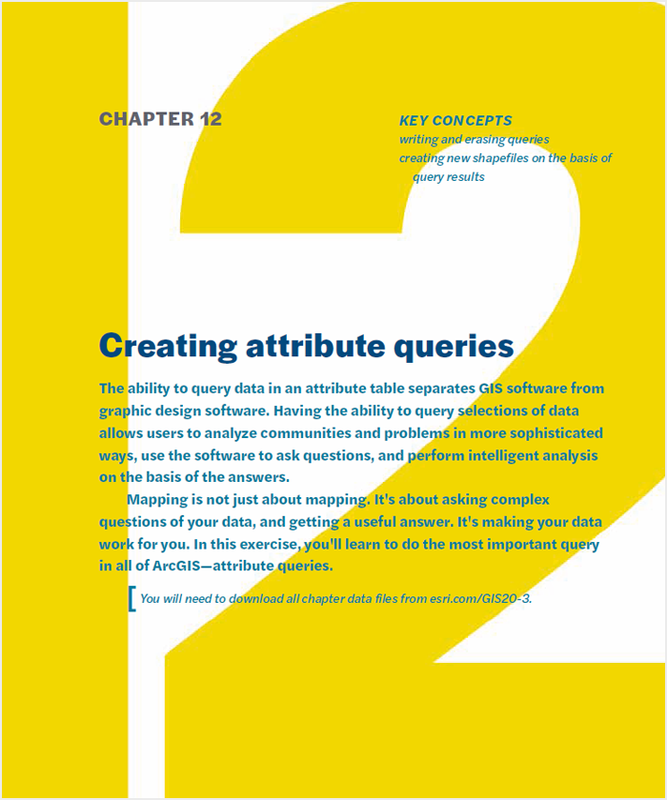 Often, the purpose of joining data to a map is to visually display the distribution of a dataset through a thematic map (covered in the next chapter). Joining your own data to a shapefile can be extremely useful. It’s hard to overemphasize how important this skill is. It’s somewhere between oxygen and pizza. In this exercise, you will learn how to join your own data to a map. This is straight-up amazing, and a precursor to some fantastic thematic mapping. Changing column types, using color ramps, creating custom legends, exploring layouts. Thematic mapping enables you to show distribution of data across geography. It is one of the most frequently used GIS tools. 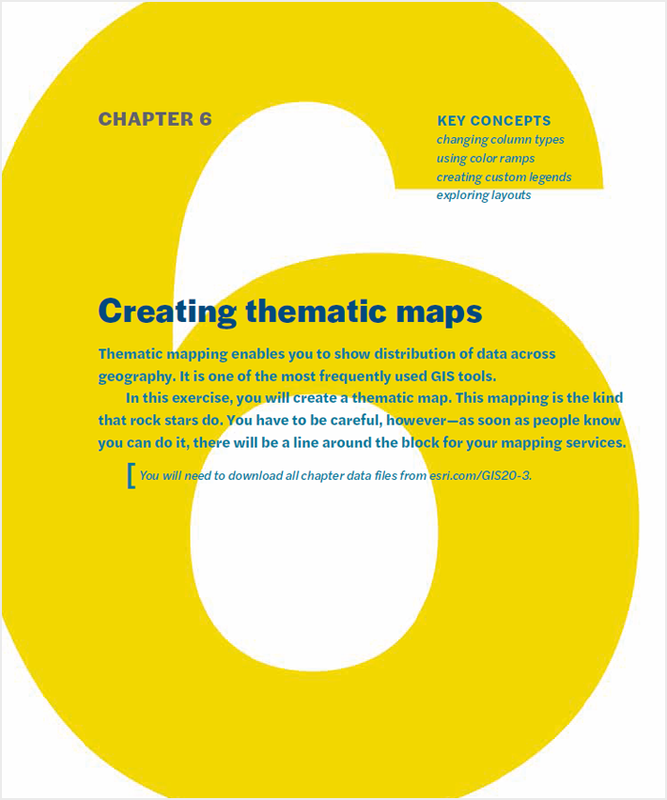 In this exercise, you will create a thematic map. This is the kind of mapping that rock stars do. You have to be careful, however—as soon as people know you can do it, there will be a line around the block for your mapping services. Adding/deleting columns, editing values, making calculations. 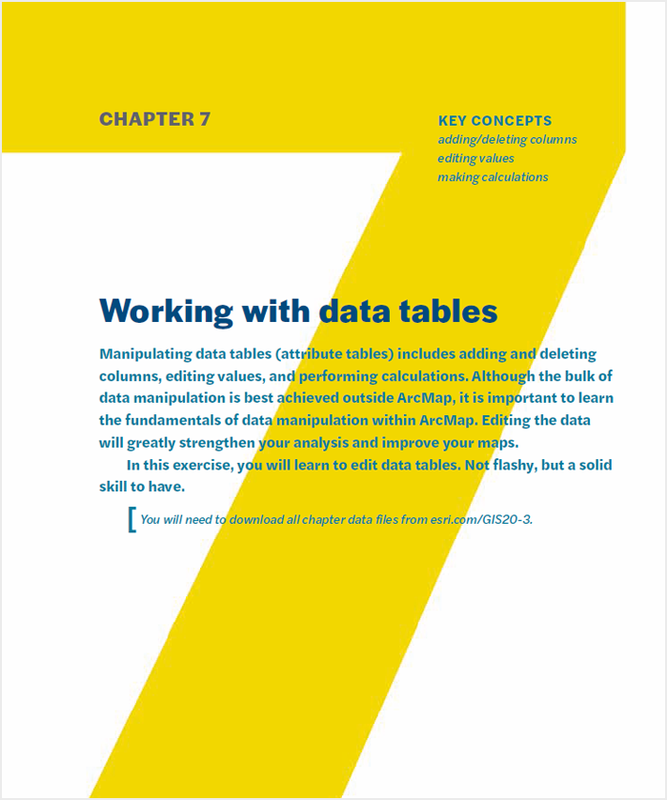 Manipulating data tables (attribute tables) includes frequently performed tasks such as adding and deleting columns, editing values, and performing calculations. Although the bulk of data manipulation is best achieved outside ArcMap, it is important to learn the fundamentals of data manipulation within ArcMap. The ability to edit data will greatly strengthen your analysis and improve your maps. In this exercise, you will learn to edit data tables. Not flashy, but a solid skill to have. Using address locators, auto and manual geocoding, using street networks and other layers. Address mapping, also called geocoding, is like creating a pushpin map of addresses. Geocoding is a skill everyone needs in their GIS work. 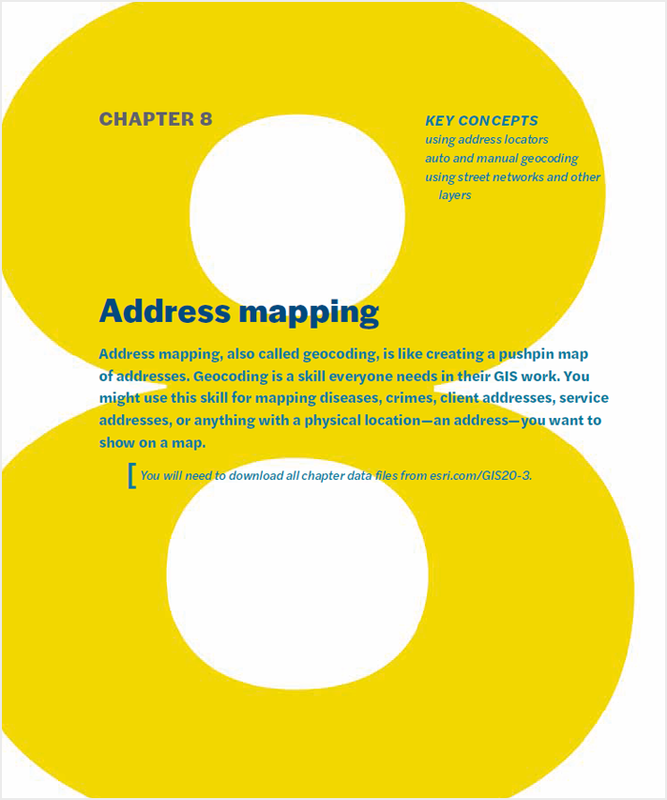 You might use this skill for mapping diseases, crimes, client addresses, service addresses, or anything with a physical location—an address—you want to show on a map. Geocoding is an amazing skill to have in your tool belt, if you wear a tool belt. Geocoding and thematic mapping are hands down the two most desirable skills in GIS. In this exercise, you’ll learn how to do it. Mapping by category, understanding advanced symbology, grouping. 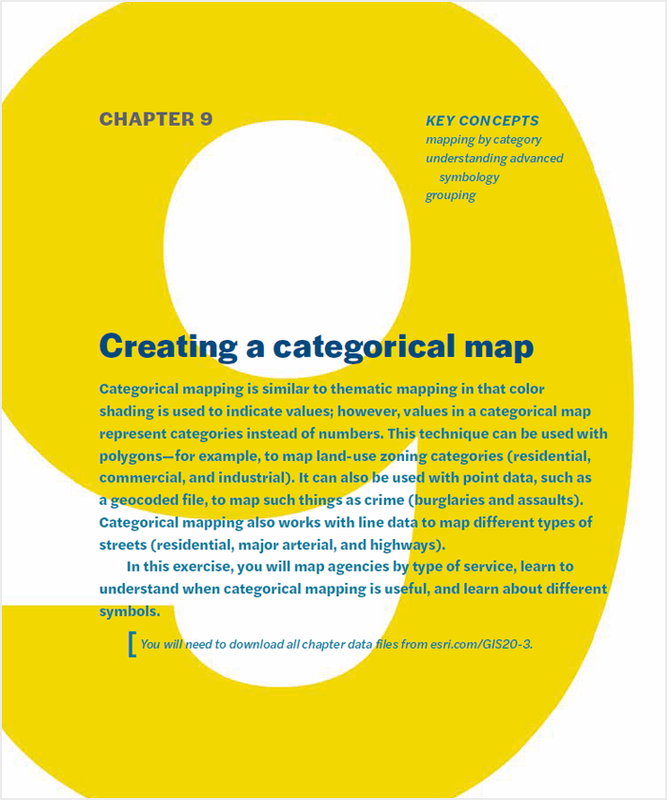 Categorical mapping is similar to thematic mapping in that color shading is used to indicate values; however, values in a categorical map represent categories instead of numbers. This technique can be used with polygons—for example, to map land-use zoning categories (residential, commercial, and industrial). It can also be used with point data, such as a geocoded file, to map such things as crime (burglaries and assaults). Categorical mapping also works with line data to map different types of streets (residential, major arterial, and highway). In this exercise, you will map agencies by type of service, learn to understand when categorical mapping is useful, and learn about different symbols. Understanding latitude-longitude, using GPS units, creating new shapefiles. 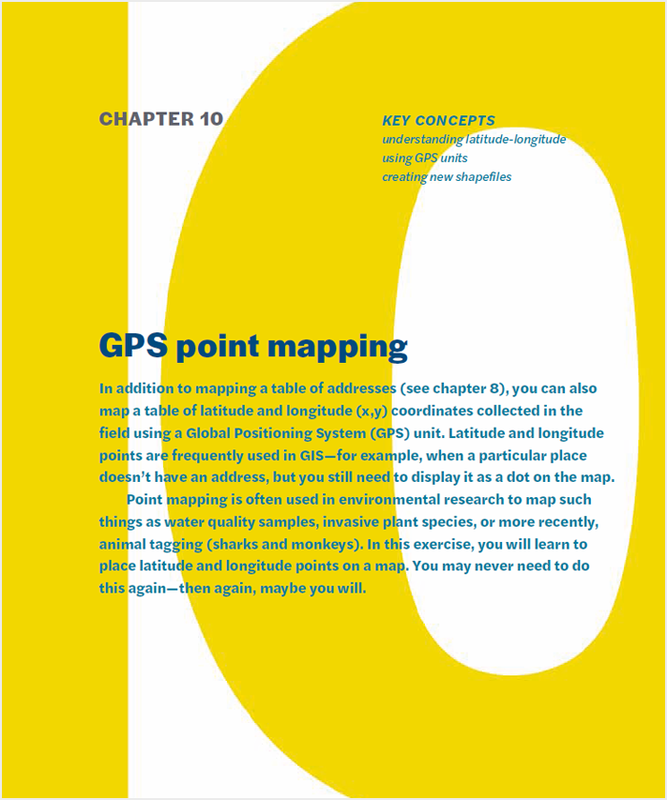 In addition to mapping a table of addresses (see chapter 8), you can also map a table of latitude and longitude (x,y) coordinates collected in the field using a Global Positioning System (GPS) unit. Latitude and longitude points are frequently used in GIS – for example, when a particular place doesn’t have an address, but you still need to display it as a dot on the map. Point mapping is often used in environmental research to map things like water quality samples, invasive plant species or more recently with animal tagging (sharks and monkeys). In this exercise, you will learn to place latitude and longitude points on a map. Changing boundaries, making custom selections, creating shapefiles from scratch. It may be necessary to change the physical boundary of an existing polygon. 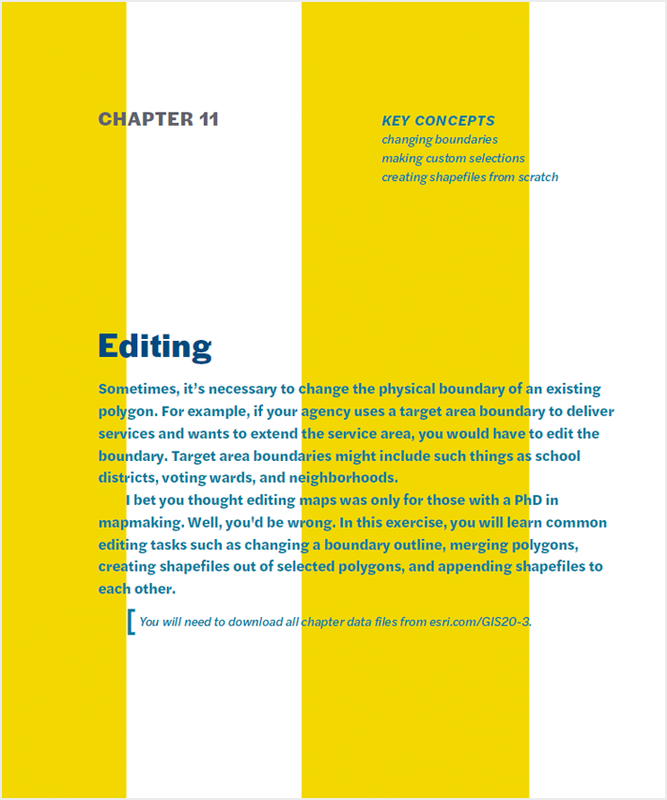 For example, if your agency uses a target area boundary to deliver services and would like to extend the service area, it would become necessary to edit the boundary. Target area boundaries might include school districts, voting wards, or neighborhoods. In this exercise, you will learn common editing tasks such as changing a boundary outline, merging polygons, creating shapefiles out of selected polygons, and appending shapefiles to each other. Writing and erasing queries, creating new shapefiles on the basis of query results. The ability to query data in an attribute table separates GIS software from graphic design software. Having the ability to query selections of data allows users to analyze communities and problems in more sophisticated ways, use the software to ask questions, and perform intelligent analysis on the basis of the answers. Mapping is not just about mapping. It’s about asking complex questions of your data, and getting a useful answer. It’s making your data work for you. In this exercise, you’ll learn to do the most important query in all of ArcGIS—attribute queries. Writing queries, understanding centroids, understanding intersect. 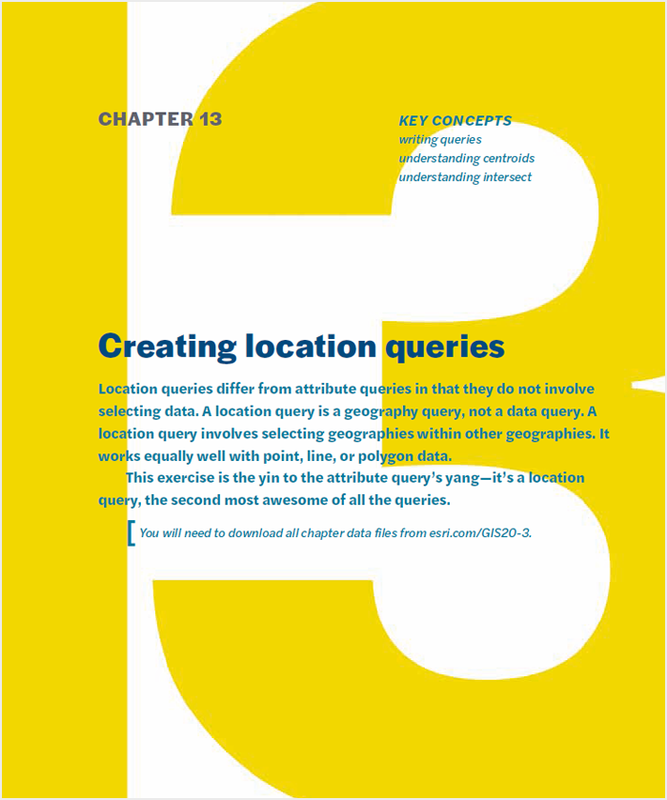 Location queries differ from attribute queries in that they do not involve selecting data. A location query is a geography query, not a data query. A location query involves selecting geographies within other geographies. It works equally well with point, line, or polygon data. This exercise is the yin to the attribute query’s yang—it’s a location query, the second most awesome of all the queries. Understanding buffer, understanding merge, understanding union, understanding append, understanding clip, understanding dissolve. Geoprocessing refers to various GIS operations that manipulate spatial data. These tools include buffer, merge, union, append, and dissolve. The ability to perform complex spatial calculations sets GIS apart from traditional cartography. It is the muscle of the GIS. In this exercise, you will explore the power tools of GIS, also known as geoprocessing. Creating geodatabases, working with geodatabases, working with ArcCatalog. You may encounter many types of files while working in ArcGIS. You have been working with shapefiles, the most basic and frequently used file type in ArcGIS. Shapefiles are used extensively not only in ArcGIS but with many other GIS software programs. Another commonly used file type is the geodatabase. 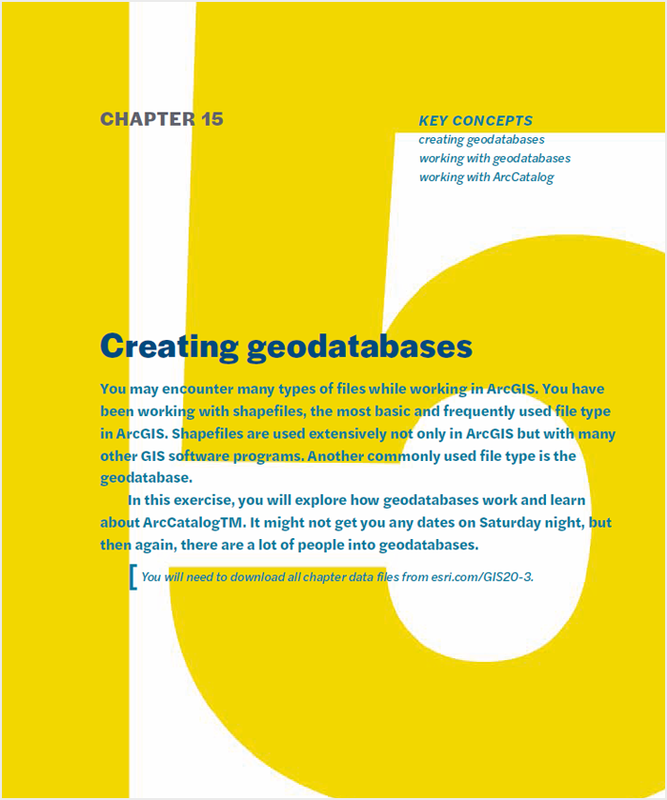 In this exercise, you will explore how geodatabases work and learn about ArcCatalog. It might not get you any dates on Saturday night, but then again, there are a lot of people into geodatabases. Using the Spatial Join tool in ArcGIS. 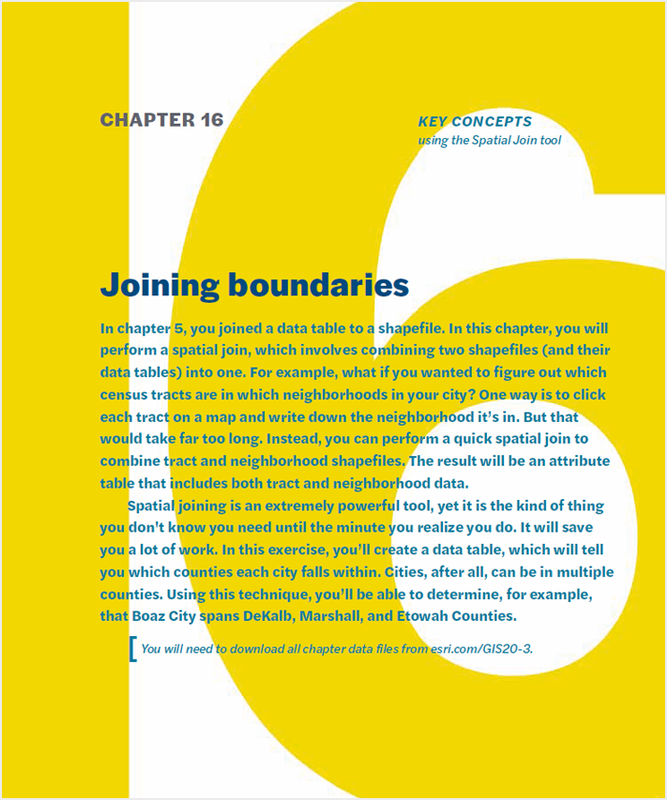 In this chapter, you will perform a spatial join, which involves combining two shapefiles (and their data tables) into one. For example, what if you wanted to figure out which census tracts are in which neighborhoods in your city? One way to accomplish this is by clicking each tract on a map and writing down the neighborhood it is in. But this would take far too long. Instead, you can perform a quick spatial join to combine tract and neighborhood shapefiles. The end result will be an attribute table that includes both tract and neighborhood data. This is an extremely powerful tool that is useful in many situations. Spatial joining is the kind of thing that you don’t know you need until the minute you realize you do. It will save you a lot of work. In this exercise, you’ll create a data table which tells us which counties each city falls within. Aerial photographs are great for displaying a photographic snapshot of what is happening on the ground in any particular area. They are not considered “smart maps” because you cannot click the map and get information about a particular feature. 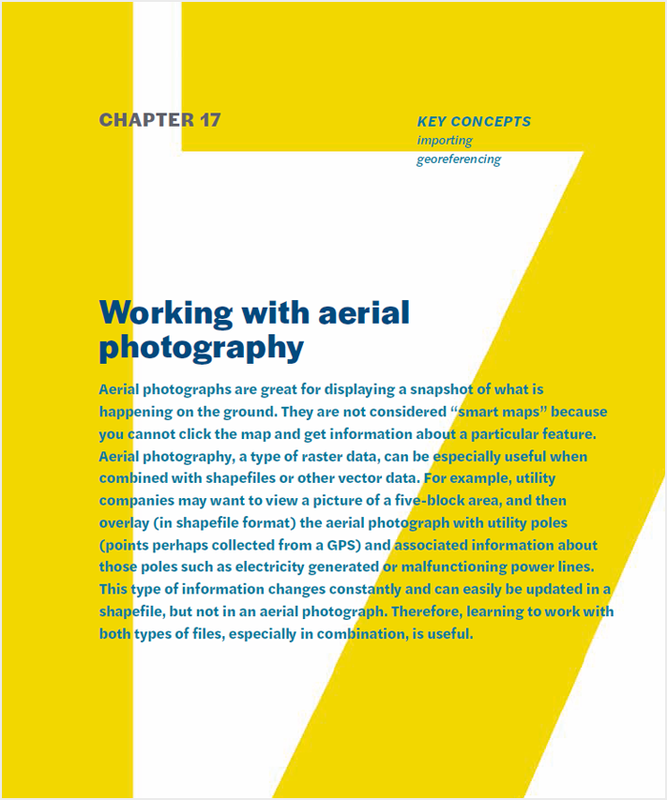 Aerial photography, a type of raster data, can be particularly useful when combined with shapefiles or other vector data. For example, utility companies may want to view a picture of a five-block area, and then overlay (in shapefile format) utility poles (points perhaps collected from a GPS) and associated information about those poles such as electricity generated or malfunctioning power lines. In this exercise, you will focus on aerial photographs; however, these techniques would also work well with a scanned map. You will import an aerial image of the area around the Alamo, located in downtown San Antonio, Texas, and overlay a street network. You will learn how raster and vector data work together by georeferencing raster data. Creating reports in ArcGIS, exporting reports in ArcGIS. 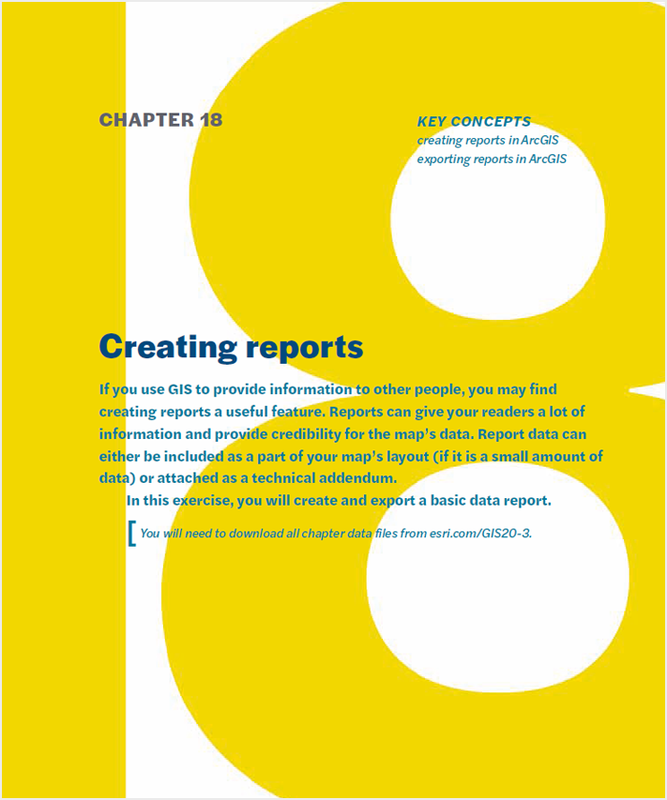 If you use GIS to provide information to other people, you may find creating reports a useful feature. Reports can give your reader a lot of information and provide credibility for the map’s data. Report data can either be included as a part of your map’s layout (if it is a small amount of data) or attached as a technical addendum. In this exercise, you will create and export a basic data report. Using layer, map, and geoprocessing packages. It is easier than ever to share maps and all the pieces that make up those maps. You can share an entire workspace or just a few layers. With package functionality available in ArcGIS, it is easy to send layers and projects via e-mail. 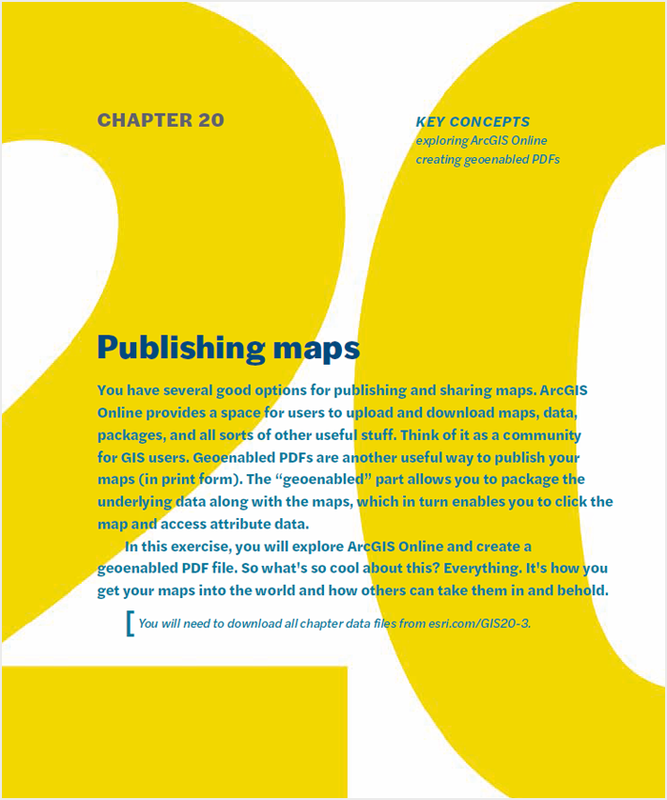 It is also easy to upload data to ArcGIS® Online, which is covered in chapter 20. Ever thought it might be good to figure out how to move these files between your desktop, laptop, and coworkers? Well, this one’s for you. 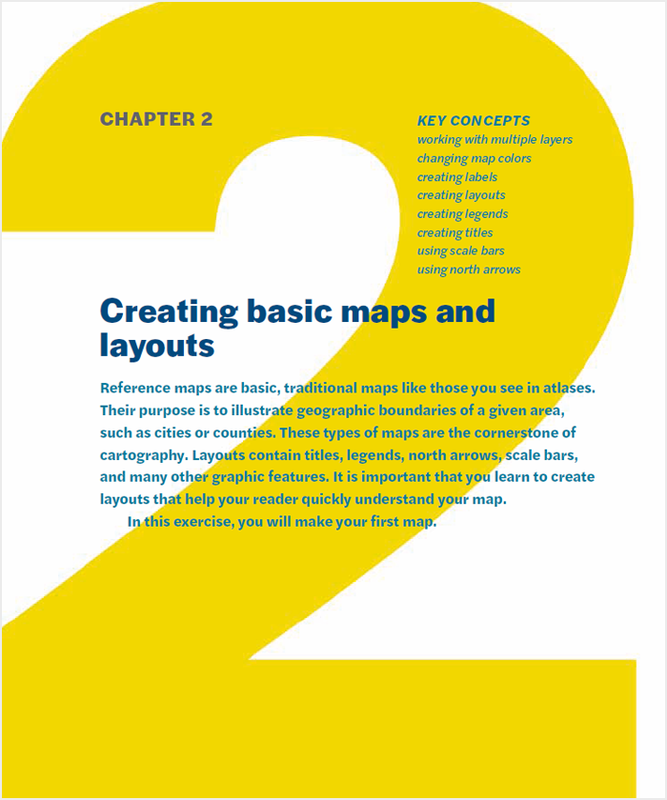 In this exercise, you will learn how to package maps, layers, and tools for the purpose of sharing your work with others. This chapter focuses on offline saving and sharing options. 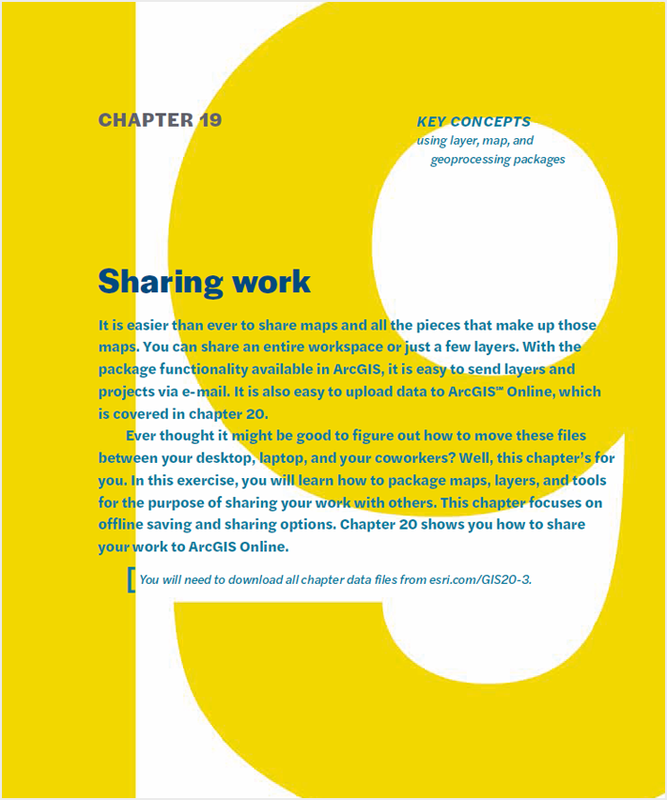 Chapter 20 shows you how to share your work using ArcGIS Online. Exploring ArcGIS Online, creating geoenabled PDFs. You have several good options to publish and share maps. ArcGIS Online provides a space for users to upload and download maps, data, packages, and all sorts of other useful stuff. Think of it as a community for GIS users. Geoenabled PDFs are another useful way to publish (in print form) your maps. The “geoenabled” part allows you to package the underlying data with maps, which in turn enables you to click the map and access attribute data. In this exercise, you will explore ArcGIS Online and make a geoenabled PDF file. So what’s cool about this? Everything. It’s how you get your maps out into the world for others to take in and behold.